This game combines crafting and questing into one heck of a fun package. Are you one of the half-dozen people who don't own Terraria yet? Well you're in luck, because it's currently on sale so you can grab it on the cheap. It won't be any easier (those boses can be a handful), but Terraria for the price of a 2 liter is still tough to pass up. SoccerDie mixes table football with shoot-em-up action, but it doesn't entirely work. Pocket Ages is a fairly formulaic freemium town builder, and not a very exciting one at that. The new update for 505 Games' popular game, Terraria, can be (and is) described as massive. They've added over 1,000 new items and block types. You'll be able to build bigger and better with all those blocks, but look out because with great blocks comes great enemies - over 100 new enemies and 4 new bosses to be specific. Oh dear. You might just have to recruit one of the 15 new pets or hang out with one of the eight new NPC's. If all that wasn't enough, 505 Games also added new biomes as well as updates to old ones, new events, new music, bigger chests, and weather. Good heavens. You can check out Terraria for $4.99 on the App Store. With the original Puzzle Quest, developer Infinite Interactive showed that a genre as deep as RPGs could be married with one as seemingly shallow as match-3 puzzle games creating a match (3) made in heaven. With their point now proven, thanks to the continued success of that series, their new game, Gems of War, feels like another victory lap. We slay dark messiahs of might and matching yet again in this edition of It Came From Canada! In the world of Krystara, all players need to start battling against hordes of monsters is a map to explore and some directions from their stern adviser. 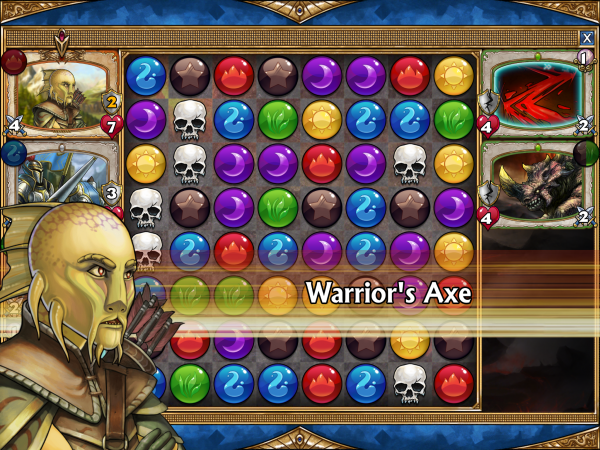 Gems of War’s centrepiece is, without a doubt, its numerous puzzle-driven enemy encounters. 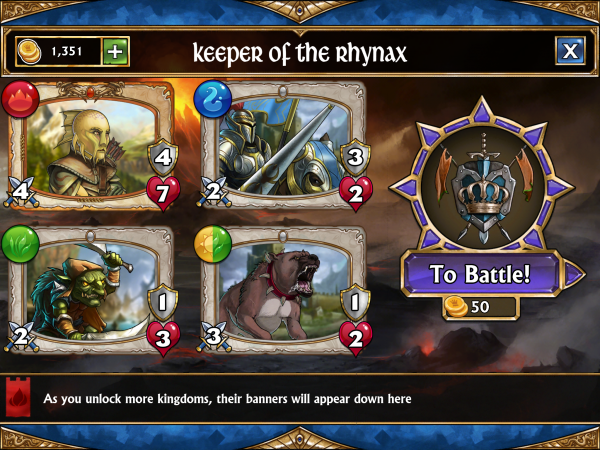 Players and their opponents share the same grid of gems and take turns matching with different gems causing different effects. Matching skull gems launches a basic attack while matching four of any gem gives another turn. And combo chains provide extra magical energy. From there though, benefits will vary. Most gems represent different elements like fire and water. Matching those gems charges up the special attacks of whatever team members specializes in those elements. Players might activate a solar-powered axe attack or defense-buffing howl driven by green energy. Managing parties to better adapt to the random nature of the puzzle board is a key component of Gems of War’s non-combat gameplay. Aside from messing around with the look of their main character, players can tweak their elemental affinity as well as equip them with new weapons built to use new elements. Players can also recruit monsters from victorious battles and create a four-person squad. Elemental diversity opens up strategic opportunities along with the ability to limit enemy options. A fair but steep difficulty curve, especially for those who choose to tackle the bonus challenges, will encourage players to constantly customize their party until it is as strong as it can be. Right now, the biggest barrier between players and the puzzle action is Gems of War’s curiously long and frequent load times. Hopefully that’s something they can fix before the official release. In any case, expect the game to fully launch everywhere soon. Terraria, the fun mining game from 505 Games, just got more challenging with its new Hard Mode. 505 games is introducing new enemies and bosses, as well as new NPCs and over 100 new items, including the Pwnhammer that can destroy Demon Altars and create new ores. Terraria also gets a new combat targeting system. You can now touch an enemy to target it and it automatically aims for you, which makes using ranged weapons a whole lot easier. If you love what you see, you can even record and share your gameplay in the Pause menu or watch your friend's videos in the Videos section under the Main Menu. 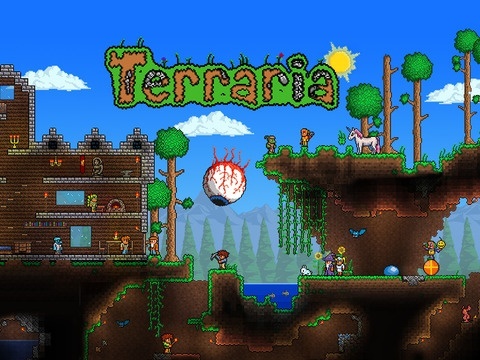 You can check out Terraria and all its new features for $4.99. Who knew that porting a game from Nintendo DS to iOS was so tough? Lately it seems like at least once per week some fairly big name games just sort of spring up on the App Store overnight. Although I suppose this week it was actually two. 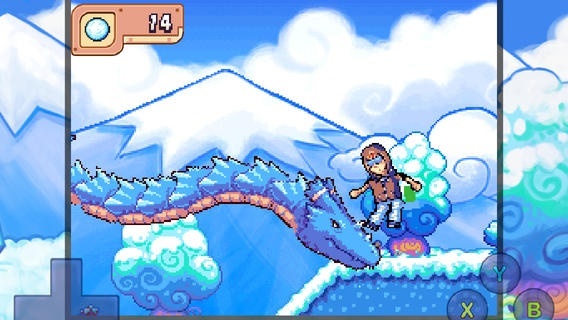 Looks like we can add 505 Games' doodle adventure Drawn to Life to that list now. Anyhow, you can grab Drawn to Life off the App Store right now for $4.99. Keep it PG. Inspiration is good but Battle Islands is a little too much like many other titles to really tantalize. Pocket Gamer reports that 505 Games has updated Terraria by adding multiplayer co-op gameplay. 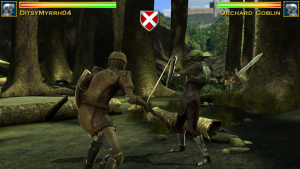 Now up to four players can adventure together in co-op, or fight against one another in player-vs-player duels that include one vs one and team battles. Players can also drag items and easily drop them into the open world. Now grab a few buds and begin adventuring together! The preeminent 2D crafting game comes to mobile at last, but in a world where those inspired by it have already taken root, is it worth the time? Part Kung-Fu epic, part rhythm-based fighting game and part self-promotion, Way of the Dogg is a fan-only affair, if that. Life can be tough for a knight. There’s a near-constant need for chivalrous heroes, taxes to collect, and strongholds to manage. And yet, they persevere because it’s the just thing to do. Knight Storm appropriately gameifies such a life to a surprising degree of success, although it does have one spectacularly large flaw that any potential users need to be made aware of. A young knight’s father has recently passed away and left him with his titles, lands, and all that other cool stuff. Players must do their best to fill their mysterious father’s boots as they fix up the compound and roam the countryside looking for evils to vanquish. 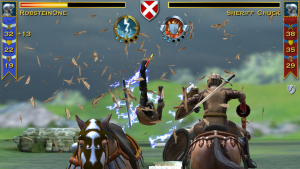 There are three essential mechanics to Knight Storm: town management, jousting, and dueling. Town management involves assigning followers to various shops and such in order to speed up the production of cash, experience, and potions. Dueling is mostly a simple matter of deciding whether or not to equip magical glyphs (at the cost of some stamina) to deal extra damage to an enemy. Jousting also involves glyphs as well as a simple dragging mechanic to place the tip of the lance in the proper spot. Put it all together and we have a perpetual adventure full of action, basic sim aspects, and plenty of gear to upgrade. Knight Storm’s presentation is probably its most impressive feature. This is a good looking game, of course, but a lot of care has been given to the smaller details as well. The slow motion shots of rivals being tossed from their mounts as their lances shatter and wood bits fly everywhere never get old, and the goofy dialog options for many of the quests make up for their lack of visual stimuli. The constant brewing of health and stamina potions is a clever idea as well since it gives players a legitimate chance to keep playing for extended periods of time without having to spend real money all the time. I could nitpick about some of the smaller issues, all of which are cosmetic, but I’d rather spend the words issuing a warning: keep an eye out for the Game Center welcome bar that pops up on the top of the screen. If it doesn’t show up, go into the multiplayer menu (it looks like two crossed lances) and select the Game Center option manually. The reason for this is because Knight Storm will not save progress if it’s not logged in. I seriously wasted several hours of potential resource accrual because absolutely none of my actions were saved over at least half a dozen sessions. I almost gave up on Knight Storm after losing so much progress but I’m glad I stuck with it and figured out the problem. It’s a fun, accessible game that doesn’t punish its players for being frugal. For a quick romp, Naughty Bear is fairly entertaining, but it really doesn't offer a ton in the depth department.